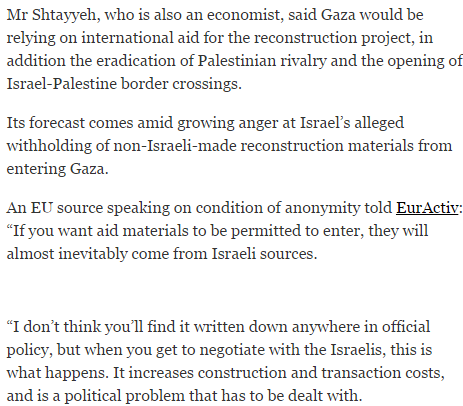 As we noted in our original post on the article, the Indy failed to reveal that the very article linked to (to buttress the claim of “Israeli-only” construction materials) also included a firm denial that any such policy exists by the prime minister’s spokesman Mark Regev. Additionally, we noted, CiF Watch contacted COGAT, which coordinates the entry of aid into Gaza, to ask them about the claim, and we received a similarly unequivocal denial. After contacting Indy editors (and Tweeting Natasha Culzac), not only was a correction made, but all of the passages cited above were completely deleted from the article. (You can see the article before the changes were made at this cached page). We commend both Ms. Culzac and Indy editors on their positive response to our complaint. Nice work. A lot of corrections lately. Well done. You are a hero, Adam! Your tireless efforts to reveal to us [non-journalists] the appalling levels and the extent of biased reporting combined with a forensic examination that you back up with every kind of reference is absolutely masterful. THANK YOU from a very grateful Brit. posts are very quick for newbies. May you please prolong them a bit from subsequent time? largе part of otheг olks աill miss yoսr magnificent writing becausе of this problem. hello!,I love your writing very so much! proportion we keep in touch extra approximately your post on AOL? electrician asks for staged payments – they may require these in order to save money. gforce san diego electrician that things are in working order. forward sufficiently to allow the airway for your lungs to remain open when you are sleeping. SnoreRx is comfortable to use – it truly is painless. SnoreRx is really a Medical Grade product which does exactly what it says on the “box”! There aren’t any bits that can come loose and be accidentally swallowed.And also the device has no metal hardware to chip teeth. SnoreRx ensuresfrom the painful jaw pain due to TMJ. an enables the even distribution of pressure to avoid teeth movement. I’ve read hundreds of really positive testimonials. Testimonial after testimonial refers to the excellent customer service mostly whenthe buyer had fouled up. There have been NO arguments – they just replaced the product! doing basic base upkeep and work on upgrades was wonderful. plus more re-playable quests and a good storyline.